Appearing Wednesday evening on Bloomberg Radio, Donald Trump Jr. said he isn't ruling out following in his father's footsteps with a future run for office. "If I can be helpful and I can be a powerful voice for that... that's my primary focus," President Donald Trump's eldest son told Sound On host Kevin Cirilli. "As for the future," he continued, "I never want to rule it out. I definitely enjoy the fight. I definitely like being out there and I love being able to see the impact and the difference that it makes on these people's lives that I get to see all over the country." Trump Jr. has emerged as a fan favorite among the president's base, assuming the role as the administrations' unofficial spokesperson, while vigorously defending his father against daily attacks from the establishment media. During the 2018 midterm election, he proved to be a fundraising juggernaut for Republican candidates, helping Sen. Ted Cruz (R-TX) alone rake in nearly $500,000, according to Politico. 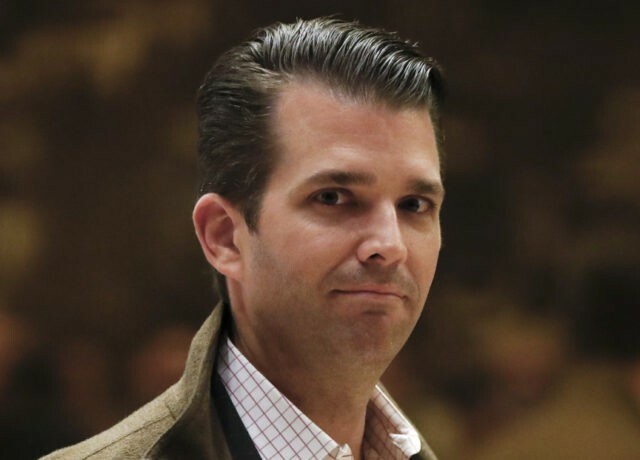 Asked when he would consider launching his political career, Trump Jr. replied: "We have a lot of time," before adding "My father decided to get into politics at 68. I'm 41, I've got plenty of time." Last night's remarks aren't the first time Trump Jr. has signaled his interest in leaving the real estate business for politics. In April 2017, the New York Post reported the president's son was toying with running for governor of the state of New York. "Don Jr. said he is interested in running for office, such as governor of New York," an unnamed source told the Post, "but the position of mayor of New York would be less interesting to him." Speaking before the F6 Labs gun club in Hicksville, New York, Trump Jr. reportedly told attendees, "Do I want to be behind the scenes and be a mouthpiece and fight back against crazy liberal media? Maybe." "Going back to doing deals is boring after 18 months. The politics bug bit me," he jokingly added.